When You Should Replace Your Car Tires. Having good tires underneath your vehicle is a necessity for proper safety. Good tires also help your vehicle to perform well and be efficient too. Unfortunately, a lot of car owners aren’t quite sure when it’s time to replace their tires. At some point in the lifespan of your tires, they actually begin to lose traction and braking ability. Using tires that need changing can result in fatalities, so make it your duty to recognize and replace your vehicle’s old tires today. The National Highway Traffic Safety Administration (NHTSA) confirmed that, buy estimating that approximately 200 fatalities may have been caused by tire failures. Here are steps you can use to figure out if you need to get a tire change: Check the tire tread and see if it’s down to one-sixteenth of an inch or 1.6mm – The tire is no longer safe at that point. You can use a tread depth indicator or gauge to measure your tire’s tread and see if it’s worn out.. Check out the tread patters and look at the bars that form between them or the bars that run across them. If you notice that the bars begin to wear out and become leveled with the tire’s tread, then you know it’s time to get your tires changed.. Take a penny; put it on the center of the tread with the Lincoln facing you. If you can see the tip-top of Lincoln’s head or if you can see part of the hair on Lincoln’s head, then you need a tire change.. Irregular tread wear can be a sign that your tire isn’t properly aligned. This and worn out suspension can be a sign that your tire’s life span has been dramatically shortened.. Have you noticed any abnormal bulges or bubbles in the sidewall? It can be caused as a result of driving with low pressure or driving through a pothole or a curb. You’ll need to get a tire change. 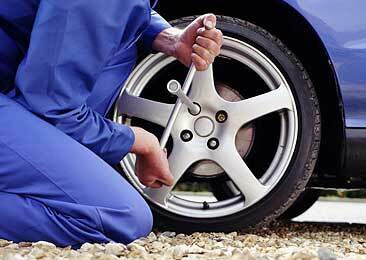 Try to make sure that you change your tires at least every 6 years. You can come to us for help. If you are looking for small engine repair services in Ottawa, mobile car battery boosting, mobile tire changes, or snow blower and lawn mower repairs then give us a call to book your mobile small engine repair today. We repair and tune-up small engines such as lawn mowers and snow blowers. The best part is that we come to you so no more waiting in line or traveling back and forth to fix your small engine equipment.